He was implying that we had to strive to be better than ourselves. He received many awards in his lifetime. He always attended the ceremony, and if necessary, made an incisive speech. But he never went for glory. The award was a sign, I suppose, that he had set his own standards. I started this piece as we are going to Johannesburg tonight to attend the Italian Chamber of Commerce Awards Dinner, where my father in law is to receive an award for his contributions to Italian culture and business in South Africa. He too has set his own standards. My father has two awards framed in the dining room at the village house in Kakouri. It is a simple two storey stone house set in the valley of the village, from where the old village rises towards the mountain. The lower level above the cellar was where animals were kept and their body heat rose through the floorboards to warm the bedrooms above. 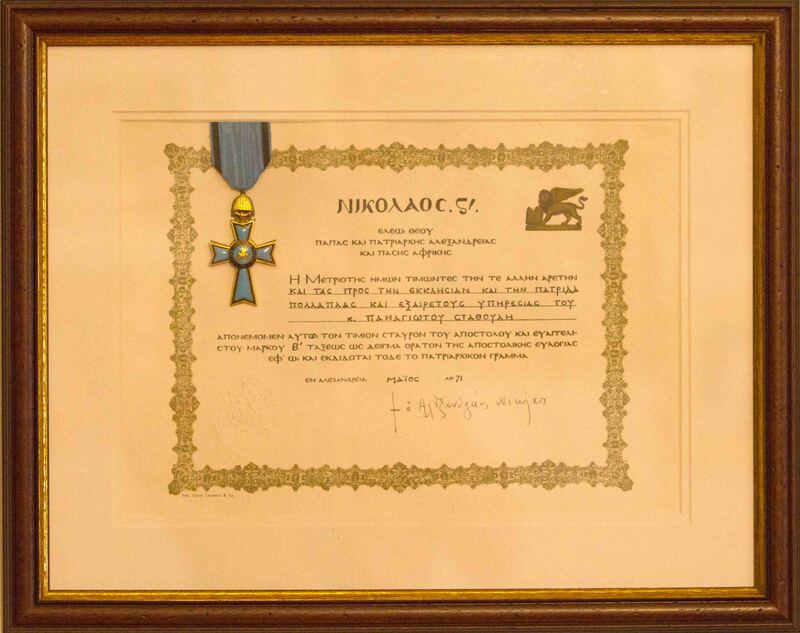 The once stable now holds the awards of the Cross of Apostolon from the Patriarch Nicolaos. The older one I cannot date but was awarded to my grandmother, Marigo. The Patriarch of Alexandria was incumbent from 1968, so my grandmother’s cross must have been awarded shortly after that. My father’s cross was awarded in 1971. The cross is real, blue ceramic with gold filigree edges. The certificate is written in High Greek and I cannot understand all of it. It is awarded in recognition for service to church and country. My father was 44 years old at the time. Four years before that, when he was 40 years old, he proudly made a speech at the opening of the Alberton Hellenic Hall as chairman of the community he headed. The Crosses of Apostolon and their certificates hang in the stables that are now the dining room of his father’s house in Arcadia. Not at his home in South Africa, nor his office where he received many people and could have easily boasted. These hang hidden away for a few villagers to see. And for his children and grandchildren to see. Our achievements are different. We may have excelled. We may have stable incomes. But we have not dreamed beyond the possible to make the impossible come true. The Crosses of Apostolon hang to show that we have set our own standards. They hang to show us we can dream big.